Shreeram Inamdar, professor in the University of Delaware’s Department of Plant and Soil Sciences and director of the water science and policy graduate program, has developed a new collaboration with researchers in France concerning water quality. Inamdar is working with Anne Jaffrezic and Laurent Jeanneau, scientists at the University of Rennes and the French National Center for Scientific Research (CNRS). The partnership was initiated in January when Guillaume Humbert, a doctoral student of Jaffrezic, traveled to UD on a French scholarship for a three-month study visit. He worked with Inamdar and Thomas Parr, a postdoctoral scientist, to develop a mathematical model to characterize dissolved organic matter in soils and streams for his study catchment in France. A publication on this work is in preparation. On March 5-7, Jaffrezic and Jeanneau visited UD and presented a research seminar titled “Dissolved Organic Matter Biogeochemistry at the Critical Zone Observatory AgrHys (France): A French ‘Promenade’ Through Temporal and Spatial Scales.” They met with various UD faculty members and visited the Fair Hill experimental watershed in nearby Maryland, where Inamdar and colleagues are studying the impacts of extreme weather events on water quality and aquatic ecosystem processes. Their visit occurred at a time when Newark and the surrounding region were pummeled with a large snow event, which is atypical for the region. To further strengthen the partnership, Inamdar made a return visit to France on June 23-27 and presented an invited talk at the University of Rennes and CNRS. 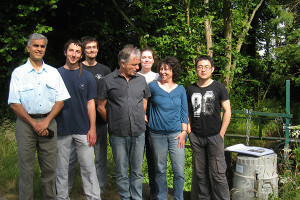 He also visited the French watershed study site, the Kervidy-Naizin catchment in Brittany that is part of the Critical Zone Observatories (CZO) network in Europe. Researchers at the site are investigating how fertilizer use and other practices in agricultural watersheds are impacting the concentrations of nutrients – nitrogen and phosphorus – in streams draining these landscapes. Similar to the Fair Hill experimental watershed, streams in this watershed have been instrumented with state-of-the-art, in situ electronic sensors that measure and record water quality every 15 to 30 minutes. This high-frequency water chemistry data is especially valuable to study sudden changes in water quality, also referred to as “hot moments.” Such changes could occur during large storm events, ecological events such as autumn leaf fall and/or anthropogenic pulse inputs of pollutants or contaminants. Understanding these sudden changes in water quality and the value and reliability of the sensors is an important research priority and one of the focus areas of this collaboration. 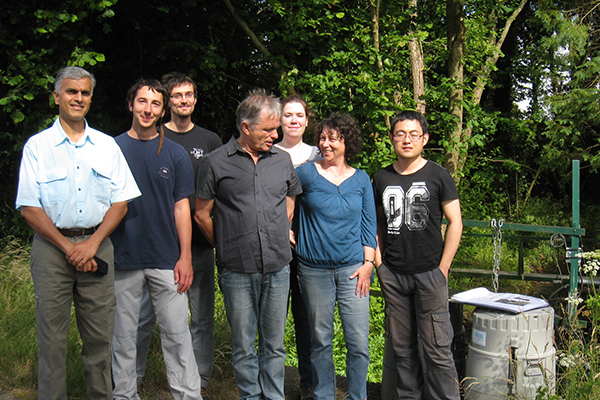 Future plans involve additional study visits by French doctoral students and faculty members to UD in 2016 and data and results comparisons between the two experimental watersheds. The partnership and Inamdar’s visit to France were supported by the National Science Foundation’s (NSF) Experimental Program to Stimulate Competitive Research (EPSCoR) Track 1 and 2 awards to UD. This article can also be viewed on UDaily.